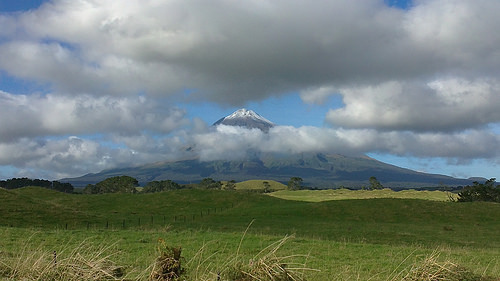 Yesterday, it couldn’t have been a better time to visit Mt Taranaki. We’ve recently based ourselves for a few days in the splendid little city of New Plymouth and travelled South-East to Stratford. 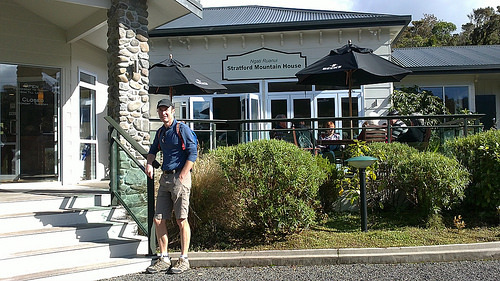 From there, turned off down Opanake Road to East Egmont to the Mountain House Café & Accommodation. Took us about 45mins all up. Once again, Mt Taranaki was about to work it’s magic on me. 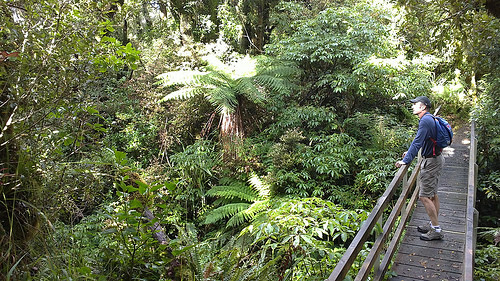 On the Mt Taranaki walks, you’re literally surrounded by thick canopies of ferns and the lushest growth you’ll find anywhere in New Zealand. Ha, I’ve learned my lesson from previous Alpine walks – you really do need to dress for the conditions. 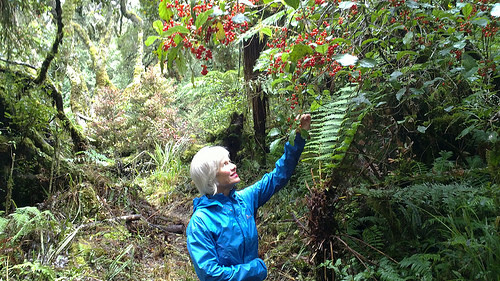 The native bushland around Mt Taranaki is so dense and moist it literally embraces you – folks, believe me, this is an enchanted other-world. Sometimes you find fantastic service in the most unexpected places. Now I know why we had to book at the Mountain House café. Every customer was greeted warmly on their arrival and the food is excellent. The staff are lovely but worked off their feet. Not only are they baristas, wait staff and cashiers but they also act as receptionists for the accommodation here. Having worked up an appetite on Mt Taranaki walks we devoured the excellent risotto and Asian Salmon dishes and finished it off with good coffee and a very fresh piece of delicious mud cake – lovely texture. Time to head to Dawson Falls. We gave a ride to a couple German hitchhikers – young girls with those cut-off shorts and jandals – sleeveless tops and no jackets! Their parents would have had a blue fit. Dropped them off in Stratford then travelled to the beautiful Dawson Falls. This waterfall is beautiful – a cascading.,powerful avalanche of water. Be warned that the walk down and back up Dawson Falls is quite steep and you will need to be fit and sure-footed. Astonishing enough, we saw people navigating these steep steps…once again, in jandals. Wonders of all kinds, never cease. We are mystified as to why our travellers still miss out this gorgeous region. But we have noticed a trend away from the usual beaten tracks which is heartening. Hey serious travellers, you do need to visit this beautiful region. It’s an untouched world you’ll remember it for the rest of your days. 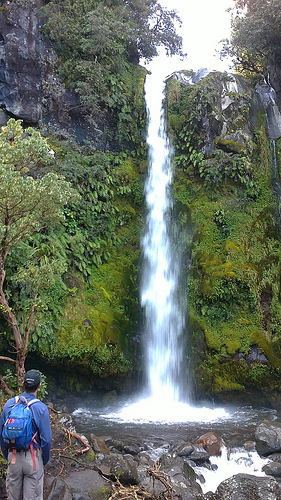 Happy travelling on Mt Taranaki walks! View some Depart of Conservation information.